Selling your home in Louisville during Autumn can be wonderful. There's less competition on the market and the season gives you the opportunity to show case your home as a great place to cozy up for the winter. 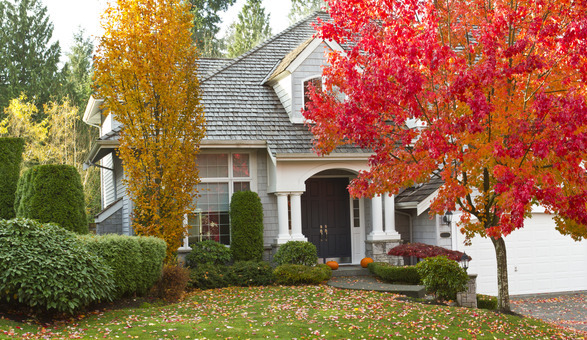 Follow the step below to stage your home for a fall showing and you'll be closing before the holidays. As the seasons change, the days get shorter and the nights getting longer. This is good for sellers. Why? Because not only do well-lit rooms look bigger, but they're also more inviting. Before a showing, make sure to turn on all your lights, especially ones you can see from the street. Buyers will feel that glowing welcome as soon as they arrive. Close your eyes and envision yourself in a warm, cozy room. Do you see yourself relaxing in front of a bright fire? Yeah, the buyers do too. Few things say “welcome home” like an inviting fire in the fireplace and some well-placed candles, so take advantage of the season and help buyers see themselves at home during your open house. A general rule when showing a home is to stick to unscented candles, since you never want to alienate a potential buyer who has an aversion to a certain scent. However, if you’re showing your home in the fall, it's your chance to break that rule and light a few apple cinnamon or pumpkin pie candles. The reason being is smell is so intricately tied to emotion and harnessing the aroma of fall will evoke memories of apple picking, pumpkin carving, leaf raking and other family-friendly activities. So, call your friend who sells Party-Lite or Scentsy and stock up. Make your place look like THE place to stay in and cuddle with the ones you love by adding extra pillows and luxurious throws. Anything that will encourage a buyer to feel relaxed and at home, ready to curl up with a good book and a comfy chair will help you to move your home quickly. The coming of fall brings crisp breezes and brightly colored leaves. Embrace the natural hues of the season by adding fall-hued foliage and flowers to your outdoor landscape — mums, goldenrods, Aster, smoke bush, Heleniums, burning bush, Virginia Sweetspire, witch-hazels and Viburnum are all plants that thrive in colder temperatures and produce gorgeous, seasonal color. As is true with any seasonal decor, it’s important to not over do it. A lovely fall wreath on the front door with a pumpkin or two on the porch is a good idea. A bad idea would be having the front yard themed out as a cemetery. The key is to realize that when it comes to decorating your home for a showing or open house, it’s always better to keep it sweet and simple.